I’m pretty sure most of you have encountered a layered salad, or two, in your lifetime. They’re popular for picnics and church basement potlucks. One thing that always amazes me is how silly it is to put a layered salad in a deep bowl. They’re ridiculously pretty, so I understand that part, but try to get some of every layer and you end up with an arm full of mayonnaise. Sooooo…. I thought why not make it more simple? Everyone still loves how this salad looks, and it’s much easier to serve. Just layer, chill and cut into cake-like pieces. Voila! Remove core from head of lettuce. Cut head into quarters. Carefully seperate the lettuce layers. Put half of them in the bottom of a 9 x 13, glass cake pan. Top with half of the onion, half of the celery, half of the green pepper, half of the mushrooms, and half of the frozen (thawed) peas. Combine the mayo with the sugar. Spread half of the mayo mixture over the salad. Top with half of the cheese and half of the bacon. 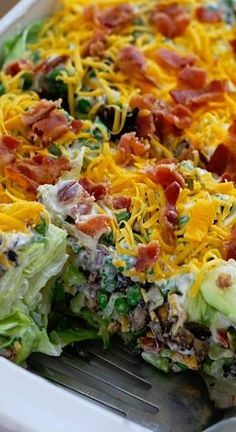 Repeat with another salad layer, starting with lettuce and ending with bacon. Cover cake pan tightly with foil. Place in refrigerator and chill for at least 12 hours and up to 24 hours. Cut into 8 to 12 square pieces. Salt and pepper to taste. Serve.